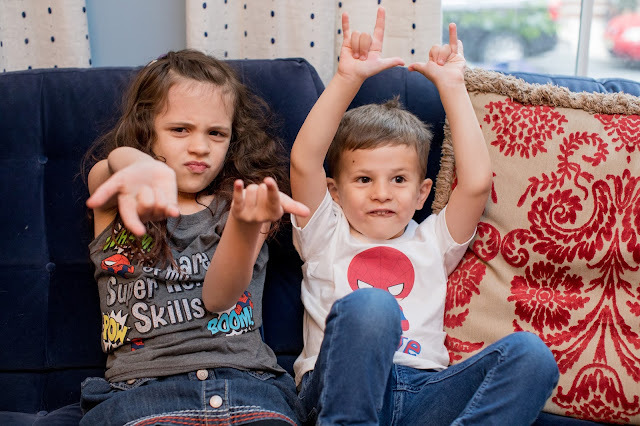 Similar to many four year old boys, my little guy is into superheroes. 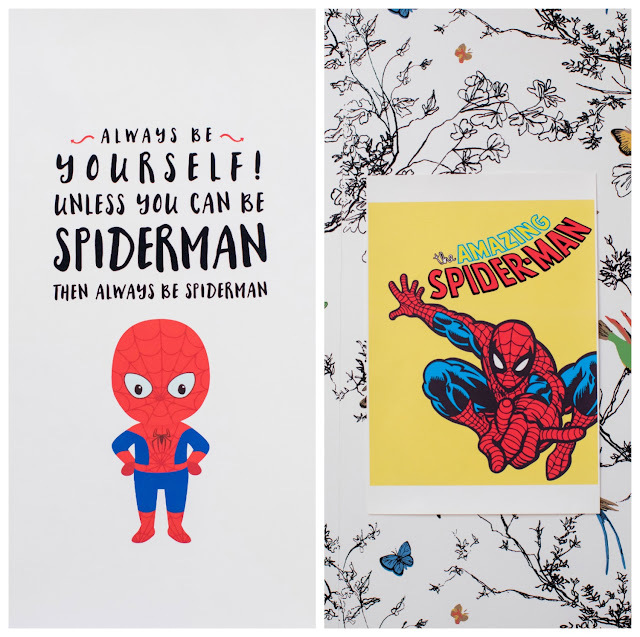 But with him, it's mostly one particular superhero: Spider-Man. He has Spider-Man pjs, Spider-Man bathing suits, Spider-Man underwear, Spider-Man dishes, and Spider-Man socks. 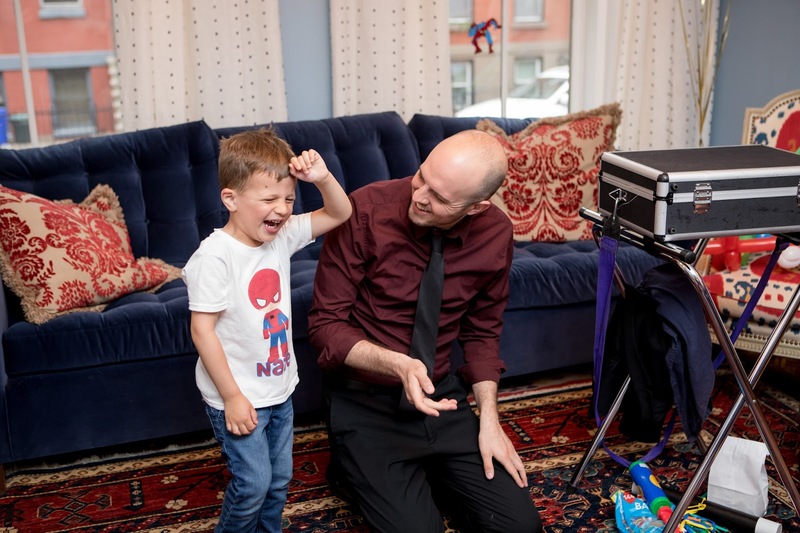 He was Spider-Man for Halloween last year, and every night he even asks for a "Spider-Man story" before bed, which can be a mundane story about pretty much anything, the only requirement being that one of the characters in the story must be named Spider-Man. 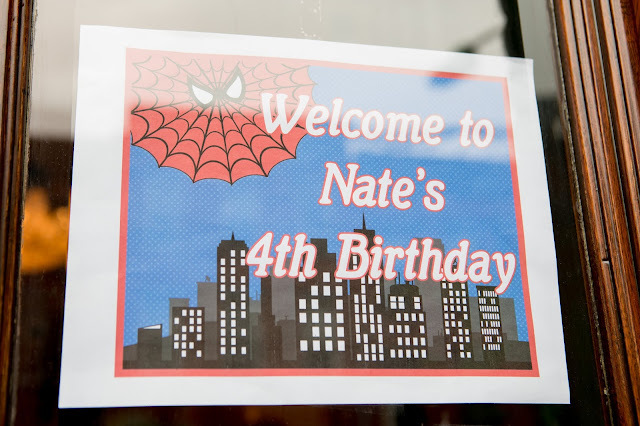 So, basically, when it came time to plan his 4th birthday party, we knew just what the theme had to be. 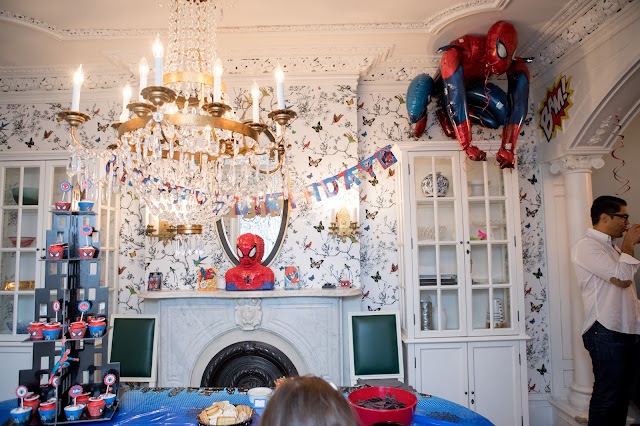 Per usual, we decided to have the party at home, and I went all out with the decor. 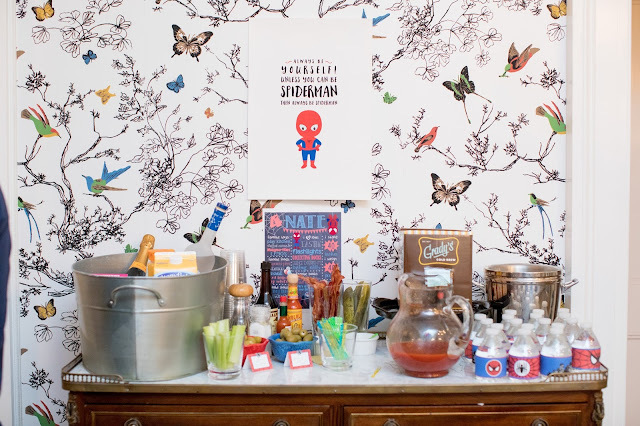 I hung wall art that I printed out from digital files I bought on Etsy (as I've mentioned before, this is one of my favorite party-decorating tricks, because it's easy and you can repurpose the art as bedroom decor later), plus big word signs (Kapow! Smash! and so on), a banner, and balloons, which we blew up ourselves. (Because we were having the party earlier than we usually do, our usual balloon-blowing place wasn't going to be open, so I bought this home helium tank, and it was so easy and convenient!). 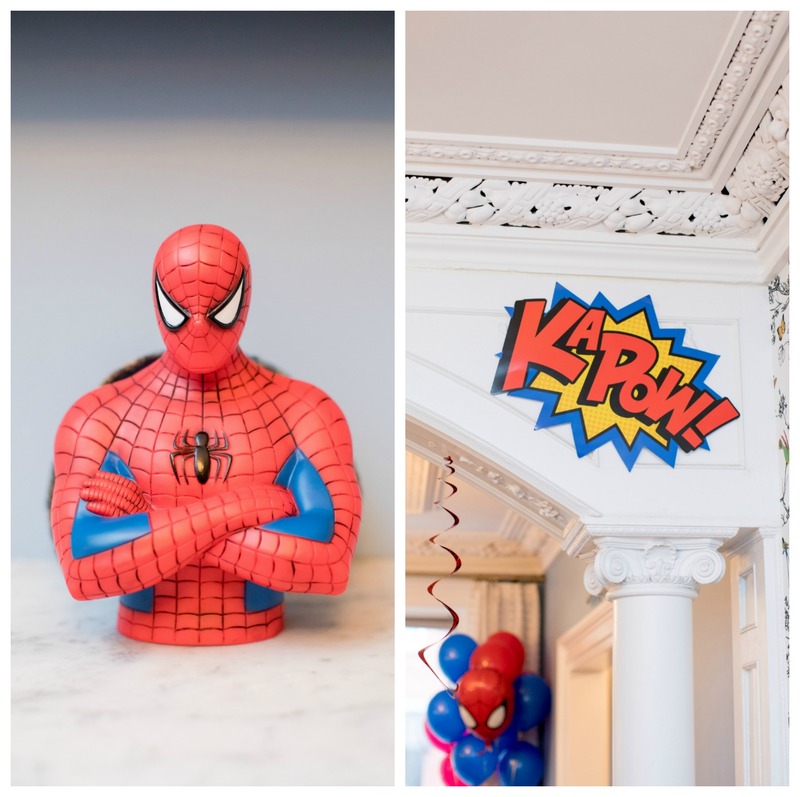 The two biggest hits though were probably the life-size Spider-Man balloon, which we perched on a china cabinet (the kids loved discovering him up there), and the ginormous cupcake tower. I hadn't checked the measurements when I bought it online, and this thing was huge! 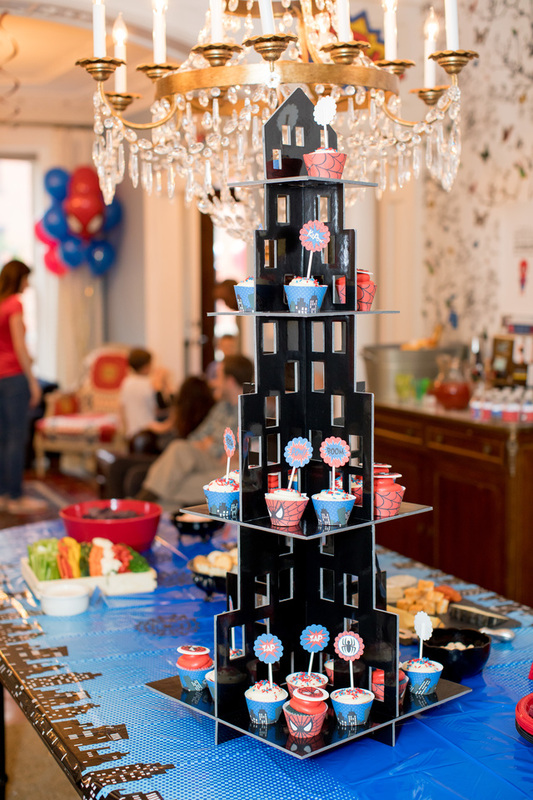 But so awesome--it was such a great focal point for the party! 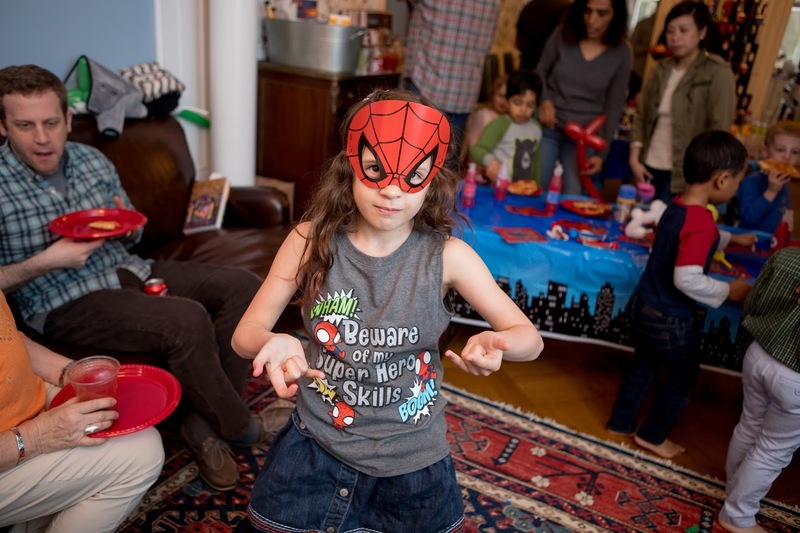 When the kids and their parents arrived, everyone had some snacks (which included this spider-shaped goat cheese dip--it's one of my go-tos for Halloween parties and it also happens to work really well for Spider-Man parties, too!). Since it was a morning party, parents got indulge in Grady's Cold Brew (our favorite!) 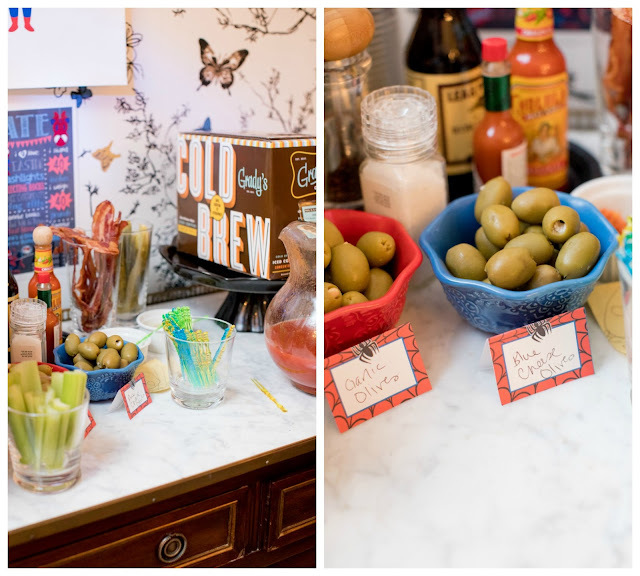 and a Bloody Mary bar. This was actually my husband's idea and it was such a hit! We put out a pitcher of Bloody Mary mix, vodka, and lots of fun toppings like pickles, bacon strips, hot sauce, fancy olives, and more. 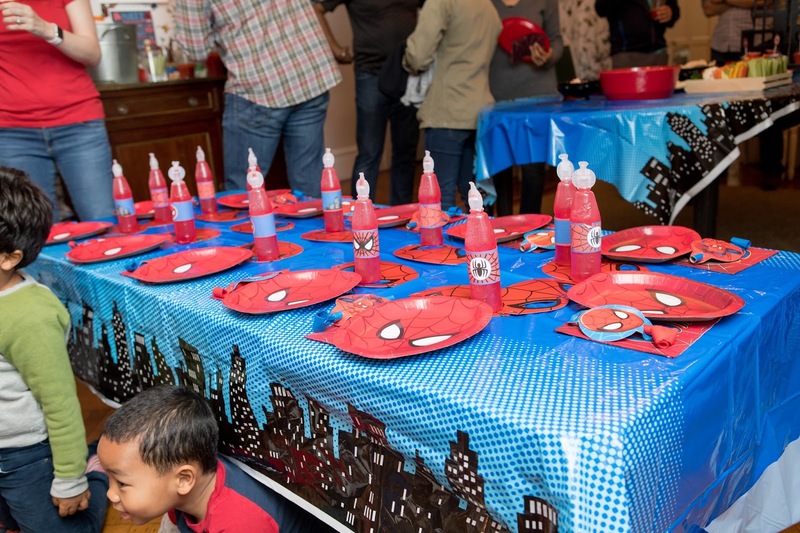 Then it was time for pizza and Kool-Aid, followed by Spider-Man cupcakes. For the kid's cupcakes, I had had the idea to have our baker dye the vanilla cake blue and top them with bright red frosting. 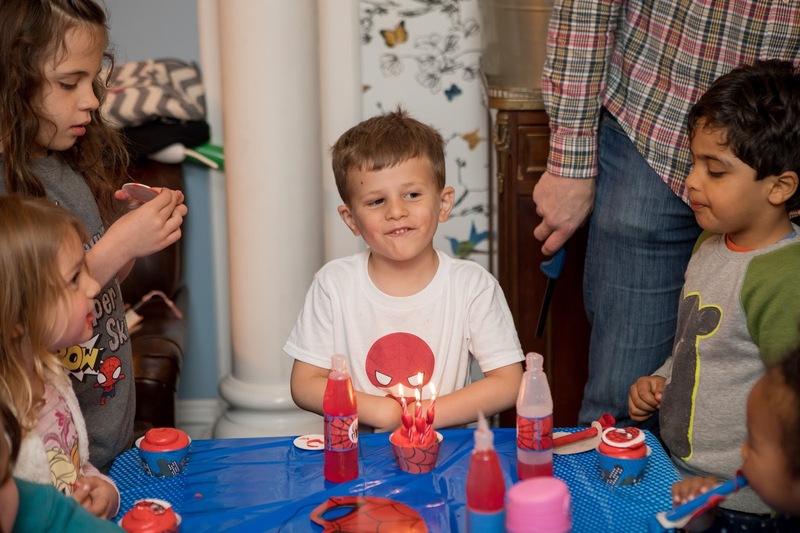 Each one also got a fun Spider-Man fondant topper. They looked amazing! 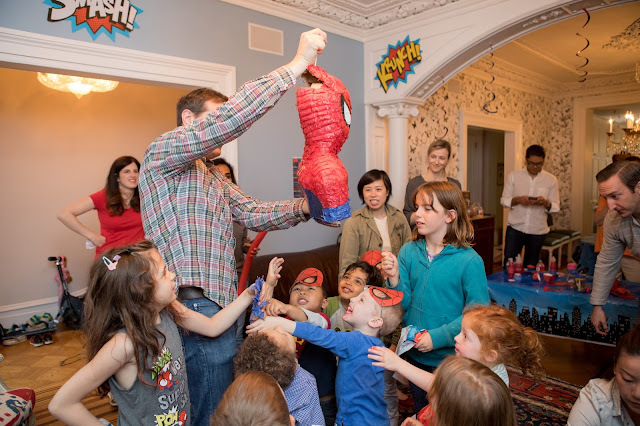 Next, because we hadn't injected enough sugar into these kids yet, we busted out a Spider-Man pinata! 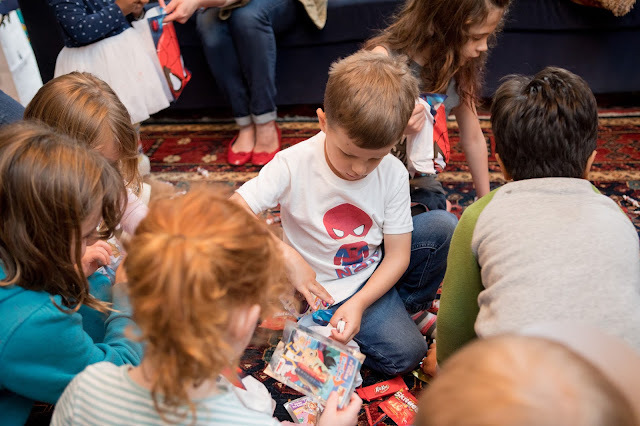 There was definitely a ton of candy in there, but because these were younger kids, I also added fun little trinkets like Spider-Man erasers, Spider-Man pencils, and mini coloring book sets, and healthy-ish food like mini bags of Goldfish. 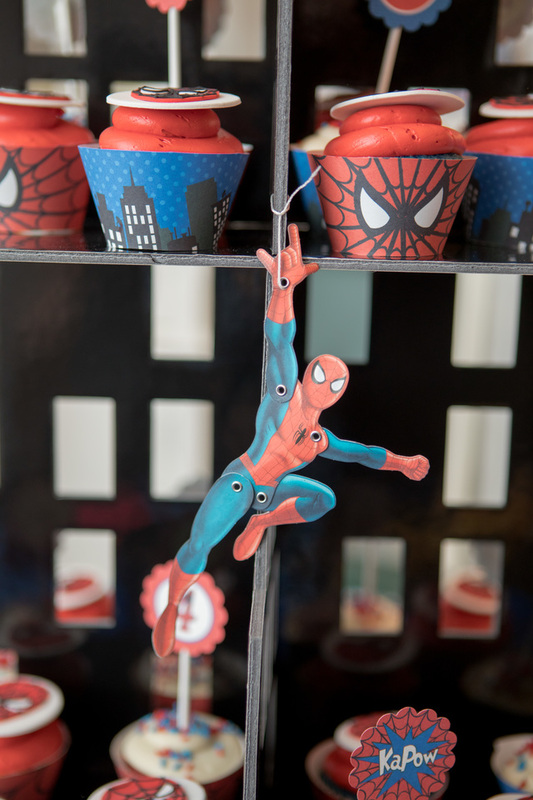 When it was time to go, the kids left with Spider-Man-themed frosted sugar cookies (once again, homemade by my mom!) 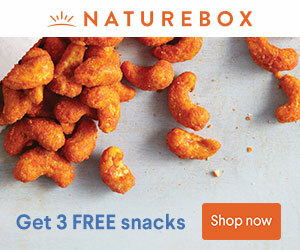 and this cute (and surprisingly-not-at-all-ugly!) 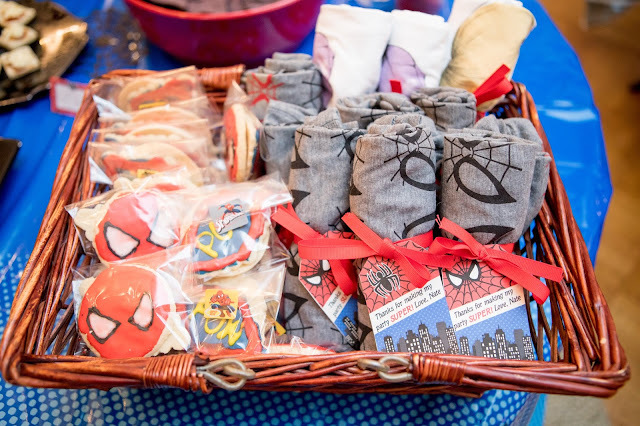 Spider-Man t-shirt rolled up and tied with a ribbon and a custom favor tag. 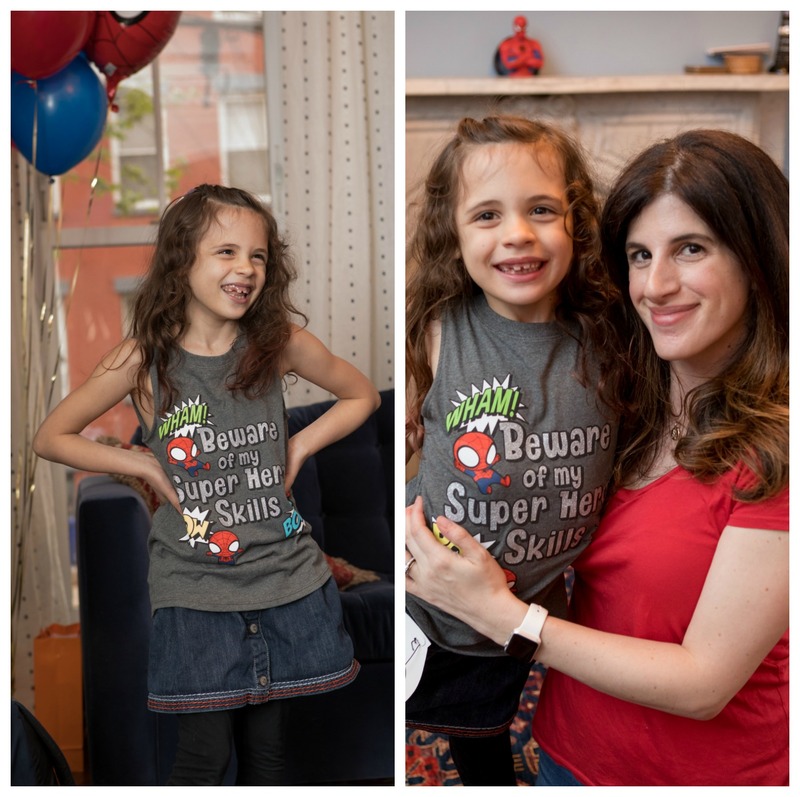 (Only three girls, including my daughter, attended, and I gave them shirts that said "Girls are superheroes" instead of the Spidey ones.) Then, all the little heroes headed home. 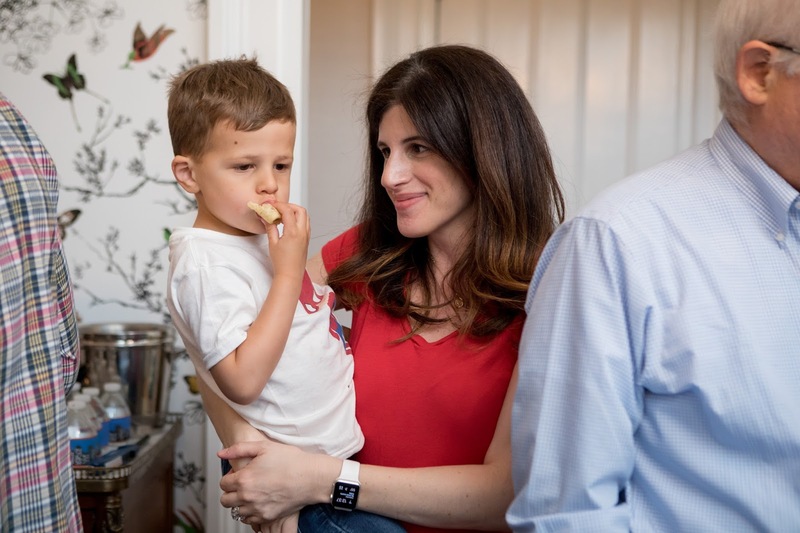 If you'd like to check out my son's past parties, here is his Nautical First Birthday (one of my favorite parties ever!) 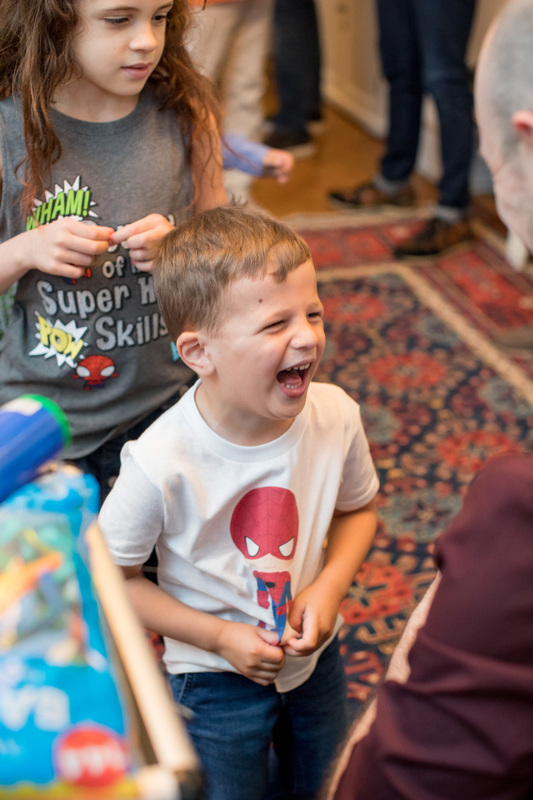 and the Sesame Street party we threw for his second birthday. 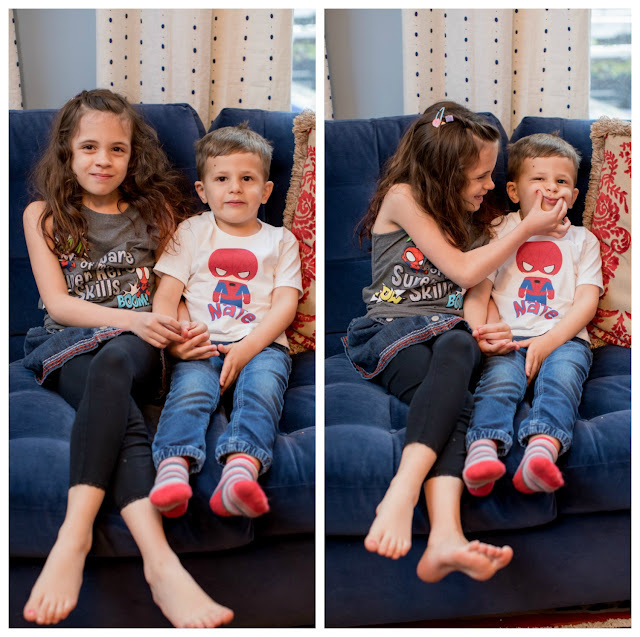 I love these pictures!! Such a cool party! Great ideas! 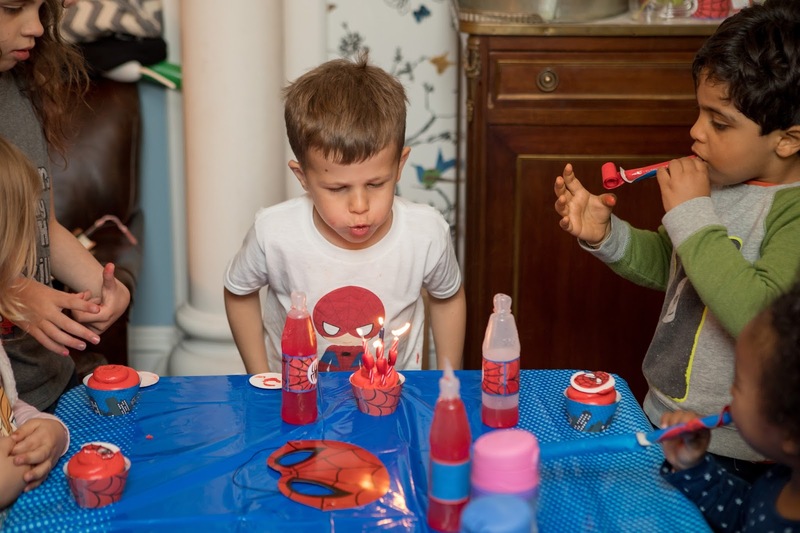 Such a cute party !! My son is obsessed with Spider-Man he would go nuts for this ! 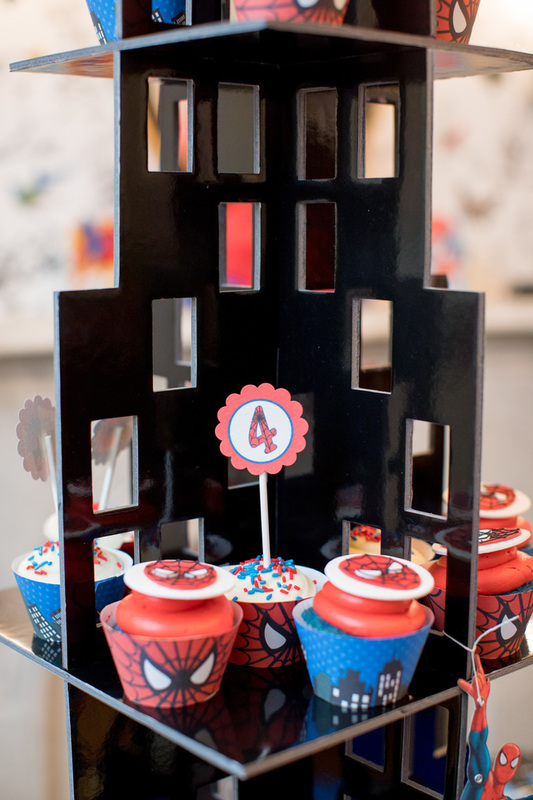 I'm thinking maybe I should do this for my husband's birthday party this year ;) Seriously. Such great ideas and he'd definitely be surprised! Who gets a birthday party like that? What an incredibly lucky little boy. This is such a fun theme!!!! I wish I had a party like this growing up! How adorable is this party idea! Love how you incorporated the theme in the decor and food! 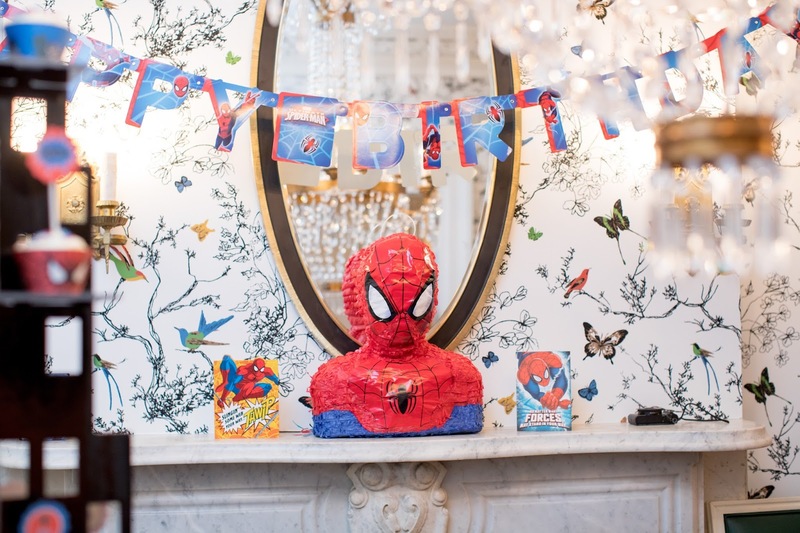 That Spiderman balloon is the coolest too! 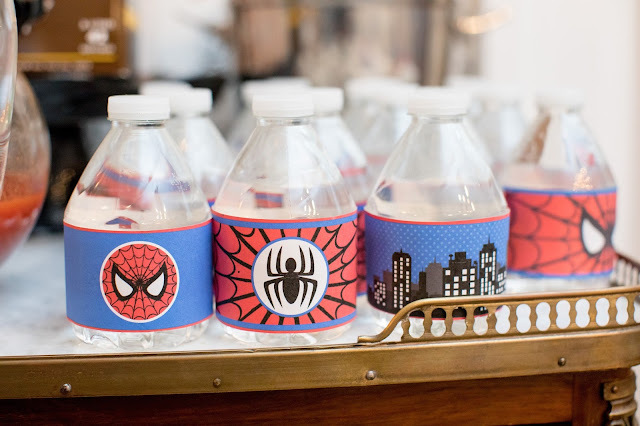 These are such great ideas and everything turned out so cute! 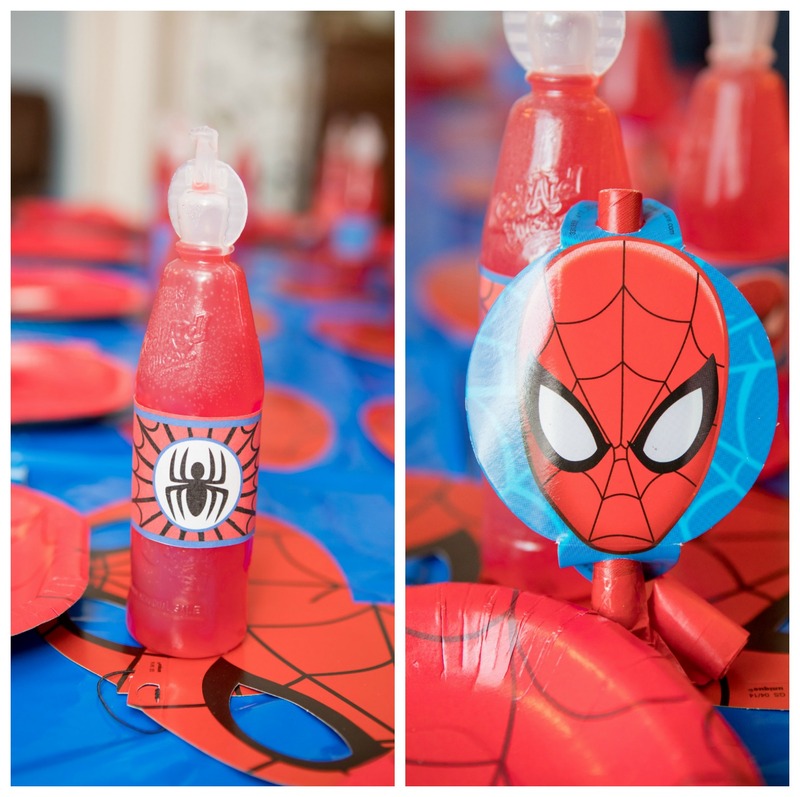 I will definitely be using a few of these ideas for my son's party in a few weeks! Great post (and adorable pictures)! Hi good work, thank you for sharing the article it's really look nice and it's very entertaining. Surely it's a great way to entertain kids with this type of balloons,thanks for the idea, Keep sharing. If you are in need of helium gas for balloons visit balloonee. This idea was good and it would attract many, now because of the availability of portable Helium Cylinders usage of helium balloons have become most common in parties and celebrations.